PROGRAM INFO - Wild About Birds, Inc.
- Classroom programs which allow small groups of up to 40 students an opportunity to get up close and personal with the birds and many specimens of feet, beaks, feathers and wings. - Assembly style programs for an entire grade, up to 150 students, presenting age appropriate education with lots of questions and answers. - Special events, such as outdoor festivals, include a table display and perched birds. - Custom presentations for civic organizations or other non-profits. 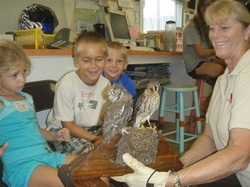 Since 2005, Wild About Birds, Inc. has provided programs throughout the summer for the Marine Discovery Center Summer Camps, and to Volusia County Schools such as Spirit Elementary, DeBary Elementary, Sugar Mill Elementary, Ormond Beach Elementary, Pine Trails Elementary, and many others. We are happy to provide you with an outline of our programs as well as references. Our program fees vary according to the size of your group and the length of the program. Please contact us for price and availability.